Take all of the Masala ingredients, place them in a pestle and mortar and crush them into a paste, add a little drizzle of oil if need be. 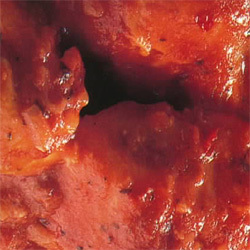 Rub the chicken pieces with the Masala and set aside in a large bowl to rest. Add the oil to a pot on a medium heat and brown the potatoes on all sides, remove and set aside. Add the onions and cook until beginning to brown. Now add the chicken pieces and cook, turning frequently for about 15 to 20 minutes. Add the water and simmer for a further 10 minutes. Add the potatoes and simmer for another 15 minutes or so with the lid off until the potatoes are soft and some of the water has evaporated. 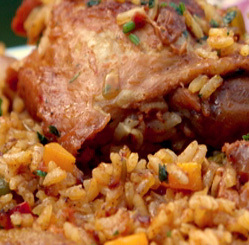 Try it with this yellow rice recipe. A true Taste of Cape Town. 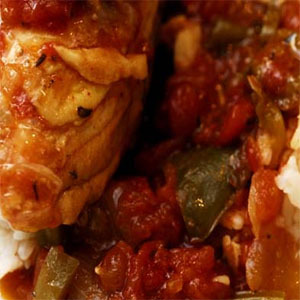 In a bowl, mix together the tomato sauce and soy sauce, then place the chicken strips into the sauce, mix to coat and leave to marinate while you prepare the peppers. 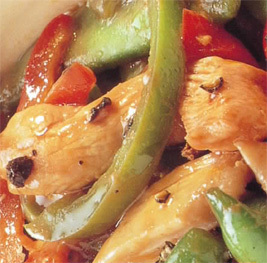 Heat a little oil, about 2 tablespoons, in a wok or large pan, add the chicken and stir fry for about 2 minutes. Add the black pepper, toss and stir fry for another 2 or 3 minutes. Add the sliced peppers and the peas and stir fry for another 5 minutes or so. Now add the Oyster sauce and toss around over the heat for another 2 minutes. That’s it, you are done. Serve straight away with noodles or rice. It is a simple and very healthy meal. Heat the oven to 180 Celsius. 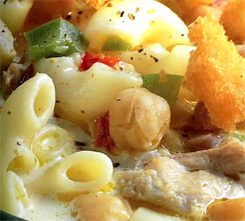 In the base of a casserole dish, place the chicken pieces. In a bowl combine the chopped tomatoes, tomato puree, soup powder, chili, basil, vinegar and crumble in the stock cube, give it a stir and pour the whole lot over the chicken pieces. Place the casserole in the oven for 50 minutes to one hour. Done and foolproof every time. 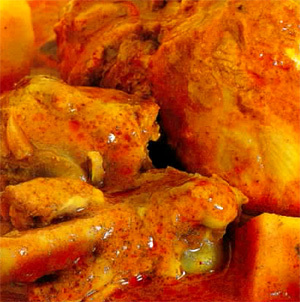 Perhaps you’d like to try something like the Kerala country chicken mext time, Authentic indian food made easy. 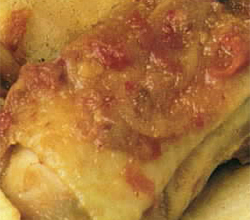 In a large pot on a medium to high heat, add the bacon and chicken pieces and cook, stirring frequently for about 6 minutes until the chicken is white. Add the onions and cook for about another 5 minutes stirring constantly. Now add the potatoes, butter, stock and milk, give it a stir, bring it to the boil, reduce the heat and allow to simmer for 45 minutes. 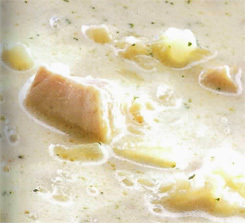 Add the cream, stir to combine, add the parsley, stir again and then simmer for a further 5 minutes. Serve straight away with your favorite bread or rolls and a salad t finish off the meal. In a large pot on a medium to high heat, melt the butter and then add the garlic, spring onions and chicken pieces. Stir fry for about 4-5 minutes until the chicken is white. Add the herbs, chickpeas and stock and bring to the boil. Season with salt and pepper , reduce the heat to a slow simmer, place the lid on the pot slightly askew to allow some of the steam to escape and simmer for 1 hour. Add the chopped peppers and the pasta shells, give it a stir to ensure that the pasta is covered by the stock, place the lid back on simmer for a further 20 minutes or so or until the pasta is cooked. before serving, bring the heat up again to heat thoroughly. Serve immediately with a few croutons tossed over to soup and some nice warm ciabatta. This is serious comfort food which you can dress up to make quite an impressive meal for guests. Add a creamy mushroom sauce or just squeeze over some lemon juice. It goes really well with cooked vegetables or a salad and possible the best of all is to have one on a nice fresh roll the next day or at work. The first thing to do is to take each chicken breast, remove the skin, butterfly them and pound with a wooden mallet or bottle until they are about 1-1.5cm thick. Next mix the breadcrumbs, salt and pepper and parmesan together in a bowl. Dip the chicken breasts into the well beaten egg, allow most of the excess to drip off and then coat with the breadcrumb mixture. Once they are all coated, place them one by one back into the breadcrumbs to ensure that they have a nice coat of breadcrumbs. 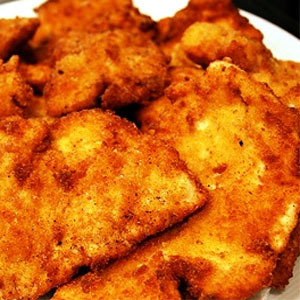 Heat the oil and butter together in a pan on a medium heat and gently fry them until the crumbs are golden brown. Paprika has always been one of my favorite spices and this tasty Carribbean dishes is a real winner. tasty, not spicy hot but full of flavor. It’s really simple and takes just a few minutes to make. (good for 4 hungry people) A little taste of the Carribbean Maaan. Season the chicken pieces with the paprika and a little sprinkling of salt. Heat a little oil in a pan on a medium heat and brown the chicken pieces (5 minutes or so) on each side, remove and set aside. Add the onions and the green peppers to the same pan with a little more oil and cook until the onion is starting to go transparent, add the tomatoes and simmer for about 5 minutes stirring accasionally. Add back the chicken pieces with any juices from the plate along with the chicken stock and reduce the heat to a slow simmer. Cover the pan, leaving some space for the steam to escape and simmer for about 1/2 an hour. Add the parsley, give it a stir and simmer for another 3-5 minutes. 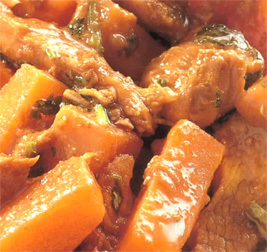 To reduce the cooking time cut the chicken pieces into cubes and follow the same process, but you will only need brown for a minute or 2 and simmer for about 10 minutes.